The first thing that comes to mind when I think about gods is flawless beings with incredible power, but that’s a horrible misconception. The truth is gods aren’t all powerful or flawless. Take the Greek gods for example. Aphrodite, goddess of love, easily gets jealous when her affections aren’t returned and expects everyone to love her above any mortal woman. Ares, god of war, is always portrayed as hot headed and quick to anger. Hera, goddess of marriage and family, always plots and causes trouble for everyone because Zeus is unfaithful to her. Essentially the gods are flawed because they are true to their nature; they are ruled by it and blinded by it at the same time. Yeine sees that—except for their powers—the gods aren’t so different from mortals. But while the gods might have unlimited power, it’s still limited by their nature. The gods can only act according to their nature, it’s the only thing that matters (Jemisin 170). This means they’ll always act according to the set characteristic they were born with. For example, Nahadoth’s nature is tied to chaos, the moon, darkness and shadows, so it’s no surprise that he’s weakest in the light of day. His chaotic nature also makes him fickle, and it shows when he absorbs emotions and takes them as his own or when his face continually changes to please the person closest to him (Jemisin 298). Sieh’s nature is to be childlike and a trickster, which makes him easy to taunt and quick to anger, and he absolutely can’t sit still and behave. After Scimina hurts him, the only way he recovers is by playing kids games with Yeine. Zhakkarn’s warrior like nature makes her always composed and calculating. Not playful at all, which is why she can’t help Sieh recover when he’s hurt. Kurue’s nature is wisdom; she knows it all and talks down to others because she knows best. Anything opposite to their nature becomes their downfall. Viraine explains to Yeine that gods are “powerful within their sphere of influence…but limited beyond that” (Jemisin 41). In the same page, he also calls mortals more “versatile,” because they’re not restrained by their natures. So, what happens when humans have too much power? If they have no set characteristic to define them, what kind of destruction can they cause? A great part of Jemisin’s story revolves around the use of power and the subsequent consequences. The biggest example is when Itempas won the God War and gifted the gods to the Arameri. These power hungry people used the gods as weapons and took control over world. 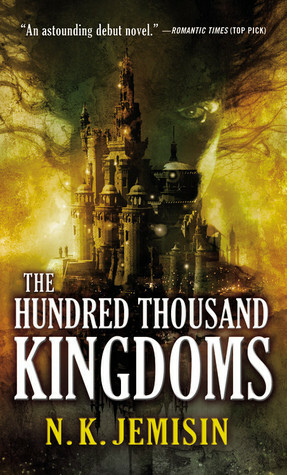 Centuries later, the hundred thousand kingdoms are ruled by one man, who along with a Consortium makes most decisions according to the rules set by the Skyfather/Itempas. There is order and peace in the world but, as Yeine discovers, a closer look shows the Arameri themselves are always at war. Court games and rigid division between the classes, keep the Arameri playing against each other. They’re not a united family, and Lord Dekarta prefers it that way. As the ruler of the hundred thousand kingdoms, he has ultimate power over the land, the people, and the gods. Power some people covet. This is why he’s made it obligatory for those who live in Sky wear the sigils. The sigils not only grant them power over the Enefadeh (Jemisin 43) but also prevents the person from harming those higher in rank than them. As Yeine struggles to adapt to her new life in the palace, one thing is clear—the Arameri believe themselves gods. And why shouldn’t they? The head of the family rules over a hundred thousand kingdoms, they live in a floating castle created by the gods themselves, and they have three powerful gods at their beck and call. Wrapped in their power, the Arameri have become inhuman in their morality. They’re not afraid of disposing of others who get in their way of rising up the ranks, cruelty goes hand in hand with their justice system, and their succession ceremony requires the sacrifice of a loved one. Yeine says, “We can never be gods, after all—but we can become something less than human with frightening ease” (Jemisin 72). This is why Yeine refuses to use the gods’ power to her advantage when other do it so freely. She rarely commands them to do things for her and instead asks them, leaving the decision open for them. She knows that playing with gods is dangerous, but the rest of the Arameri don’t share her view. Especially Scimina, who likes to chain Nahadoth by the neck and parade him around the palace during the day. Establishing control over the gods is the ultimate show of power. We see it again when Scimina makes a spectacle out of torturing Sieh (Jemisin 256-261). But for all her good intentions, Yeine also tries her hand at having unlimited power. First, when she unleashes Nahadoth upon the Menchey guards (Jemisin 243-248), and later on when she becomes a goddess herself. Mortals have no business in trying to become gods. Jemisin, N. K. The Hundred Thousand Kingdoms (The Inheritance Trilogy) Orbit. 2010.